One of the most captivating images of spaceflight, at least to my mind, does not portray the staggering power released by a 3000 tonne rocket departing the Earth, nor the grace of a space station the size of a football pitch gliding over an ocean. For me, it is the image of an astronaut floating freely in space, surveying the Universe at will, unencumbered by Earth’s annoying (yet rather essential) gravity that epitomises human achievement. When I’m asked which astronaut has inspired me the most, the temptation is to recite the more obvious ‘first’ achievements of Yuri Gagarin, Neil Armstrong or Alexey Leonov. The truth is the picture of Bruce McCandless conducting the first untethered Extra-Vehicular Activity (EVA – more commonly known as ‘spacewalk’), is not only supremely inspirational but it leaves me wondering what must that feel like…really feel like. The elation of absorbing a view that is simply unsurpassed, the exposure and isolation of floating 200m from the Shuttle’s sanctuary and the apprehension of knowing that only a few layers of material separate you from the perils of deep vacuum, crippling temperatures, radiation and micrometeorites. Thankfully those few layers of material have triumphed over the harsh environment of space and to date hundreds of EVA’s have been conducted by astronauts from many different countries. And that is what brings me to the Gagarin Cosmonaut Training Centre (Star City) in January 2012, with my good friend Thomas Pesquet – to learn about the “Orlan MK”, Russia’s latest spacesuit designed to protect astronauts whilst conducting EVA. On completion of our training we will be qualified to conduct an EVA using this system, having learnt how to maintain and operate the suit, conduct airlock depressurisation and repressurisation drills and to deal with emergency situations should they arise. Our 5 week course begins – as always – in the classroom. Like a small child in the days before Christmas we have to endure hours of waiting (in our case…theory) before we can play with our toys. However, this is my kind of theory. A spacesuit is like a mini space station with its own life support, electrical power, thermal control, voice and data communications and computer control systems – all designed to keep an astronaut alive for up to 10 hours in space. Having spent the best part of my career studying similar systems on numerous types of aircraft I have developed a rather ‘nerdy’ passion for understanding how things work and so it is with some gusto that I begin to pore over the engineering diagrams in our training manuals. I’ll try not to bore you with the ‘techie stuff’ but if you’ll permit me a couple of paragraphs…the suit’s most vital component is oxygen, not only to breathe but also for pressure…and this spacesuit has oxygen in abundance. There are 2 tanks each capable of supplying over 800 litres of oxygen. In the spacesuit we breathe pure oxygen and consume about 50 litres per hour, so under normal conditions each tank will last over 16 hours. Exhaled carbon dioxide is removed by a lithium ion filter and fresh oxygen is released into the suit to compensate for the resulting pressure drop. Electric fans circulate the oxygen around the suit – it’s a beautifully simple design built to typically robust Russian standards. The suit has to be internally pressurised to protect against the vacuum of space – without external pressure all the gases are released from our bloodstream, including oxygen of course, and an astronaut would lose consciousness after about 15 seconds. No need to dwell on the more gruesome discussions about whether or not our blood would ‘boil’ or body expand – we’d be blissfully unconscious! However, if the suit were pressurised to a ‘normal’ earth atmosphere at sea level (760mmHg) it would be so rigid when operating in a vacuum that an astronaut would be virtually unable to move. So the “Orlan” operates at a safe compromise of 300mmHg, which means our body experiences the same pressure as if you were standing on top of a mountain at 23000 feet (breathing pure oxygen). Even at this pressure the suit feels extremely rigid and the simplest tasks such as operating switches, levers, turning valves – anything that requires the bending of elbows or fingers – is extremely difficult, as Thomas and I were soon to discover. So with our week of theory complete, at last it was time to wear the spacesuits, suspended from the ceiling in the ‘dry’ simulator. The process begins with a short medical evaluation prior to donning medical monitoring equipment, cotton undergarments, socks, headset and a liquid cooling suit. The cooling suit will pump water around the body and expel excess heat into space – it’s an extremely efficient system and each suit has a temperature control lever for comfort. Sliding carefully, feet first into the suit I am reminded of my recent caving experience with ESA, squeezing into tight spaces that you’re not sure how to get out of. As the backpack is locked and sealed I am thankful that I have never had problems being in restricted spaces – I actually feel quite comforted by the confines of the spacesuit but I can imagine that for anyone who suffers even the slightest feelings of claustrophobia this would be akin to medieval torture. A correctly fitted suit is essential – and because the suit will expand once pressurised it has to be slightly too small when you first enter, but despite being a bit cramped it’s not uncomfortable and soon I am learning how to move my arms. “Think like a robot” Oleg, our Russian instructor tells us, “and move slowly – conserve energy.” This works well and soon Thomas and I are familiarising ourselves with the spacesuit’s mechanical and computerised controls. After 3 hours of working under pressure (literally! ), we emerge from our spacesuits with a newfound respect for just how hard it must be to conduct a real 6 hour EVA. Muscles that I never knew existed are sore, I’ve had something scratching my eye for the past hour which I’ve been unable to do anything about, I’m dehydrated and have cramp in my wrists, arms and fingers. But we are smiling – possibly the biggest smiles since experiencing zero ‘g’ during parabolic flight. This is what being an astronaut is about! As we begin to find working in the spacesuit easier with each dry simulation, the tasks become more complex and it is not long before we are ready to progress to the final stage of our training – the ‘Hydrolab’. 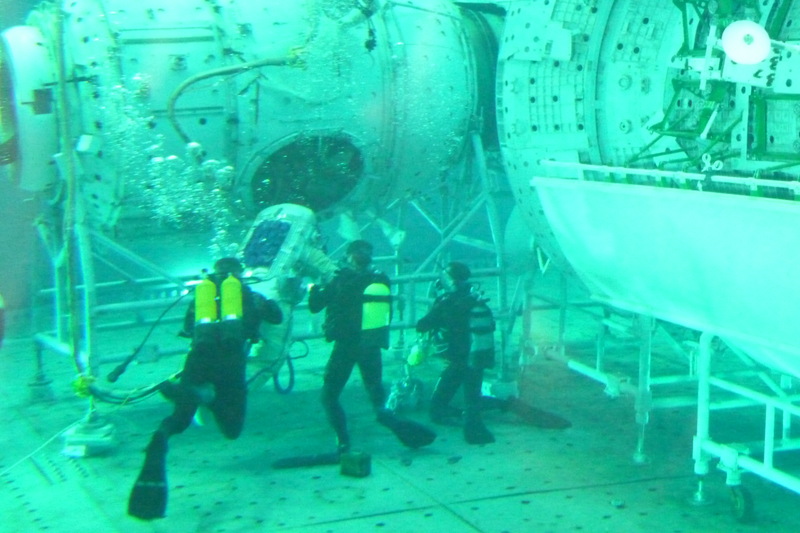 The Hydrolab at Star City is a circular pool 10m deep and 24m diameter. 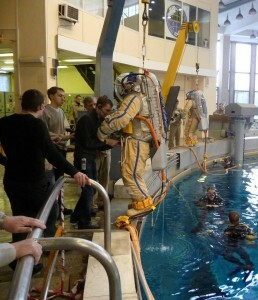 Mock-ups of the Russian segments of the International Space Station are lowered on a platform into the water and astronauts can practise EVA skills using the neutral buoyancy of water to simulate weightlessness. Sealed in my spacesuit once again, I am being lowered into the pool by a small crane – and for a fleeting moment I wonder what would happen if there were a catastrophic suit failure underwater – like a glove popping off…sometimes ignorance is bliss, I guess. As we submerge I begin to survey my new surroundings. The curvature of the visor gives a slight ‘fish bowl’ effect and I soon learn it is better not to move my head back and forth too much as it is slightly disorientating. Thomas and I are placed into the airlock and the clock is running. There is barely room to move. Tasks which were relatively easy in scuba gear the day before require ridiculous amounts of concentration, effort and time and after 20 minutes all we have achieved is to open the hatch, install a hatch seal protector and egress the airlock with all our kit. We move along our planned route attaching our safety tethers ‘via ferrata’ style to the handrails, with always two points of contact. Every move is being watched by several cameras and we know that any mistake will be pounced upon, for good reason – the odds of successful rescue for an astronaut ‘lost in space’ are not good. As each task is accomplished I can feel the strength being sapped from my arms and fingers. The suit has expanded and doesn’t fit too well anymore but I’m happy I’ll complete the EVA with some energy to spare. That is, until I realise that Thomas has been instructed to ‘play’ unconscious – an emergency situation that requires one astronaut to recover the other to the airlock, doing all the drills alone. It’s going to be a long morning! After about 3 and half hours underwater we are finally back on dry land, delighted to have successfully completed our first ‘suited’ dive. After such a strange and unique experience it seems perfectly normal that the first thing that happens as we step out of our suits is to be handed a cup of hot tea by a kind Russian doctor – how civilised is that! An EVA is probably the most physically demanding task an astronaut can undertake. 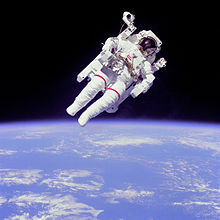 In hindsight, Bruce McCandless may not have been “surveying the Universe at will” – he was probably trying desperately to bend his fingers to reach the thruster control and return to the Shuttle, with sweat stinging his eyes and a microphone sticking up his nose – nursing sore elbows and fingers and suffering complete and utter muscle fatigue. Does that in any way spoil the image for me? Not one bit – if anything I look at that picture today with greater wonder, admiration and inspiration than I did 5 weeks ago. Each time I read an article from a Shenanigan I think ‘This one is definitely my favourite’; it’s once again what’s happening. After feeling happy to meet all of you in Moscow, being cold in the Russian winter, training hard in the Soyouz spacecraft, I’m now wondering how an astronaut can simply use a screwdriver to fix the Hubble telescop with Orlan. But I should thank you again for making me dream of being an astronaut. It gives me more and more motivation to join the ESA team. Merci beaucoup !!!!!!!!!!!!! Thanks for the comments Gabrielle and I hope you also get to train in Звёздный городок in the future! Thank you for those words, you cannot imagine how precious they are for me. As soon as ESA decides to launch the next selection I will do my best to join the team! I enjoyed reading that ! I had just woken up before reading your article, and all I can say is you put me back in a dream ^^ I want to learn to spacewalk too ! Thanks for this very interesting post. Why do you breathe oxygen and not air in the suit? Great question Sophie – and you’re right that it has to do with partial pressure. If we breathed air in the suit at 300mmHg (equivalent to that 7000m mountain), then we could suffer the effects of altitude sickness, which tends to kick in above 3000m due to the low partial pressure of oxygen in the lungs. 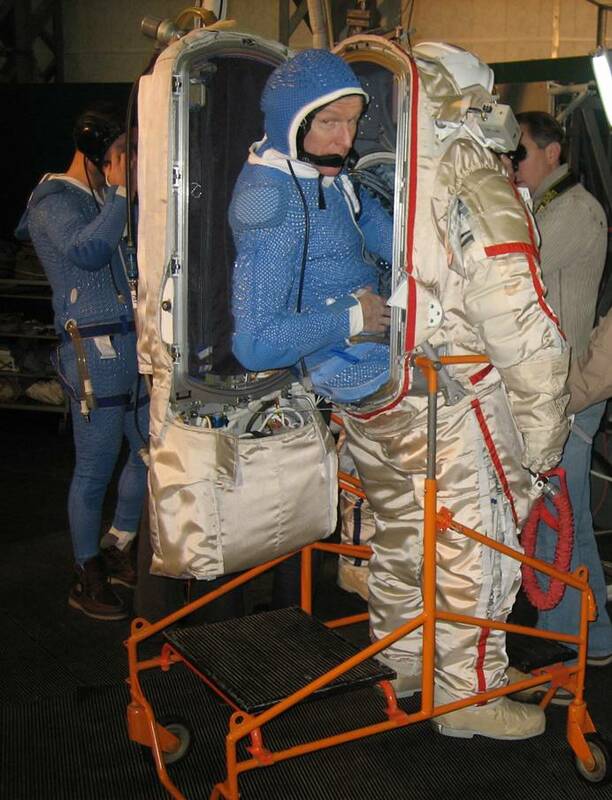 We could safely breathe air if we raised the pressure inside the suit, but amongst other factors this would make it very hard to move as the suit becomes so rigid. 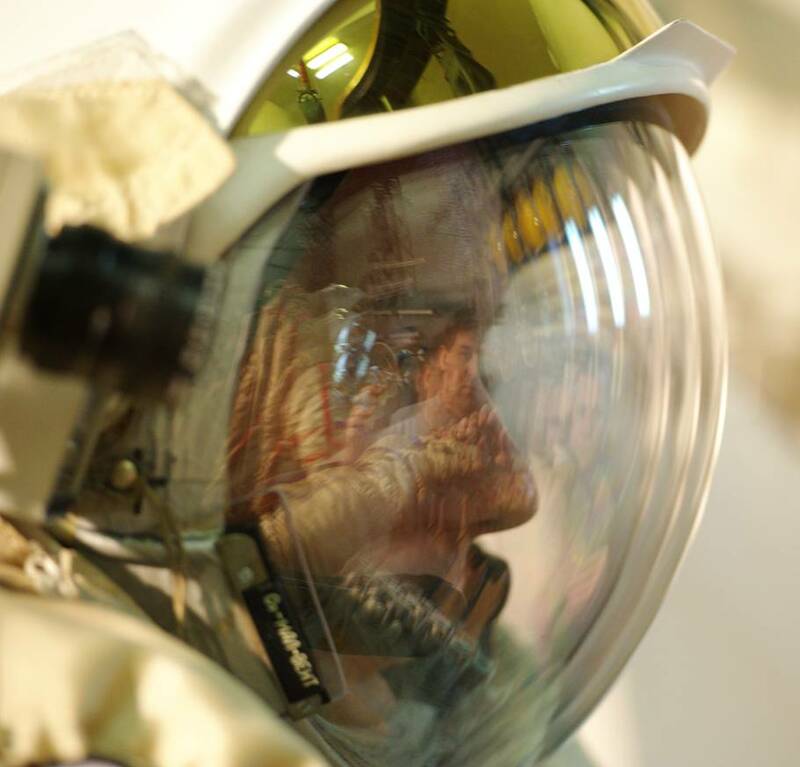 If we lower the pressure inside the suit but at the same time increase the concentration of oxygen then the O2 partial pressure does not change too much – it is slightly higher than normal but way below the level at which oxygen toxicity or euphoria may occur. The other benefit of breathing pure oxygen is that it helps to remove nitrogen from the bloodstream, which could cause decompression illness due to the low pressure inside the suit. The US spacesuit operates at a lower pressure than the Orlan and prior to an EVA astronauts “camp out” for about 8 hours in the airlock at a reduced pressure to further protect against decompression illness. I ought to add that inside the spacesuit there could be up to 7.5% carbon dioxide concentration depending on the efficiency of the lithium ion filter, so there is probably a greater risk from high CO2 levels than anything else. Sorry – long answer! Wonderful Blog as usual – you really bring the whole training alive. I hope you inspire many people to follow their dreams, just as you inspired me as a pilot. OK – enough sentimental guff – just very proud of you!! Wow what a great blog! Training sounds like an amazing experience, hopefully soon i’ll be looking at a photo of you doing an EVA 🙂 good luck Tim and the others! Thanks for giving us a fascinating insight into your training. Not sure I’d want to be stuck inside a spacesuit or a pool for hours at a time but the end result has to be worth it! Is there an equivalent to the Manned Manoeuvring Unit/SAFER jetpack-type systems for the Orlan suits? I think I’d probably feel more relaxed being tethered, though I confess if I’d been Bruce McCandless I would have faced an overwhelming temptation to try flying around like Superman. I suspect NASA and ESA would not encourage that though! Hi Phil, thanks for your comments. 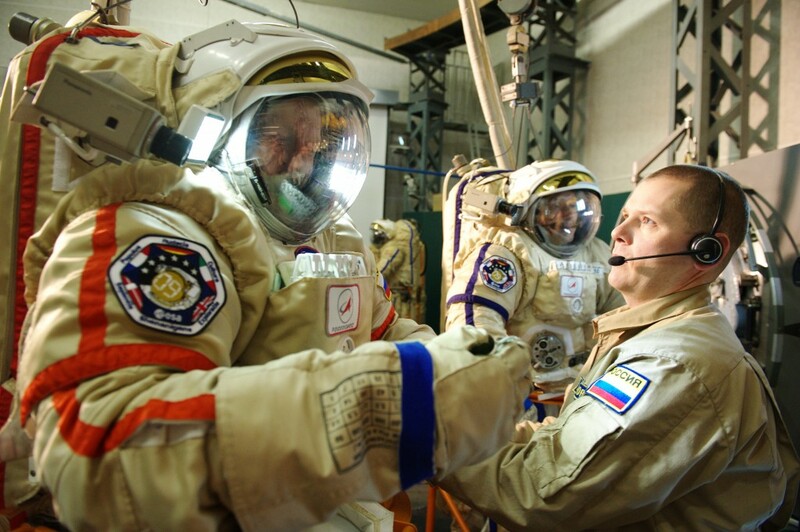 The Orlan suit can accommodate a system similar to SAFER, called уск (устройство спасения космонавта) but it is not yet operational and it did not form part of our training. So it makes it even more important with the Orlan to always keep those 2 points of contact – and personal tethers must be attached to different handrails for added protection. You say the Orlan suit allows for spacewalks up to 10 hours. Most people can’t wait for such a long time to replenish water (= drink) and eliminate body waste. How do the Orlan suit designers address these delicate needs? Jacek – there’s a water pouch (700-800ml) that gets velcro’d inside the front of the spacesuit with a drinking tube (much like a Camelback) that pokes up into the helmet area. As for the ‘delicate needs’ – that’s where adult diapers come in handy! Great blog post, I very much enjoyed reading it. I’d just like to take this opportunity to say, as a fellow Brit who one day hopes to make it into space, you are an inspiration to me. You constantly remind me that with hard work and determination, there are opportunities to make it into space via the UK. For that, I thank you very much. Best of luck with the rest of your training. Great post! Thanks for sharing this. I watched wide-eyed as Anton Shkaplerov took his first steps out of the station last week…. what an incredible experience that must be. Thanks Kate – I’ll get in touch by e-mail ref the Space UK piece. Wow, it is so great to be able to read what you are up to and fab to hear how enthused you are by this trip and all the things you are doing. Pads was worried about any other natural gas that you May create in yout suit!! I’m sorry I have to do it, since in that article there’s a combination of cosmonauts + swimming pool + training. Это русский анекдот, который я нашла сразу после падения Фобос-Грунта: “Начинается конкурс по отбору космонавтов 2012. Первый тур – плавание.” :D.
Terrific article and fascinating to learn about the Orlan suit and EVA’s. How are you getting along with learning Russian and coping with those winter temperatures? I’ve just read this and think it’s brilliant! Although, as per, Mum’s getting a bit anxious about what you’ll be doing ‘up there’. We should start a bet, who’s going to freak out first, Mum or Grandma…? Hope to see you in the summer, speak soon and have fun! Paul thinks that the bet should include Penny as she is already stocking up on Valium! It made very interesting reading until it dawned that it was you taking part!!! Then it became verr……..y interesting! We are with you all the way and think you are amazing. Fantastic blog entry, Tim. Activites involving a basic wetsuit would be most people’s limits; we’ll leave all this advanced “techie” stuff to you! Hope you’ve all enjoyed your reunion and have a really fun last few days together. Tim, brilliant article I love seeing all the photos it brings it all to life. We think that what you are doing is amazing. Maddy just sent the family the link to the your blog. Cool stuff! Thanks for the insight 🙂 Do you have Twitter by any chance? I’m not that active on it, but I enjoy ‘following’ others. How’s the Russian coming along? You’re probably fluent by now (hee..hee). Tim, this is awesome stuff and the way you write really brings what you are doing alive for us. The suit is incredible – a vehicle in its own right. I’m going to read this to the kids this evening. I like your mum’s school pool comment….is it so far removed from Porthkerris Cove in a semi-dry with numb fingers? This was an awesome read, thank you so much for this. I have a comment though, i’d be glad to be “bored” by the “techie stuff” 🙂 Seriously the spacesuit looks amazing and the feelings you describe makes me want to know a lot more. Hi Jean-Manuel – thanks for your comment and glad you enjoyed reading it! Awesome post – thanks for sharing all the gory details, although I would love to have been a fly on the wall! The training sounds intense, of course – how heavy are the oxygen cylinders? Hi Sarai, thanks for the comments! The tanks in the Orlan suit do contain 100% oxygen, but it is stored under quite high pressure (greater than 450 bar). This enables the 800 liters to be stored into fairly small tanks. Because of the high pressure the tanks are very robust – I’m not sure exactly how much each one weighs, probably 8-10kg. On the ISS oxygen can be produced by electrolysis of water (the hydrogen is vented overboard), but you’re absolutely right – the best designs for future space exploration will be closed cycle (regenerative) life support systems. Thanks in return for the reply 🙂 It makes sense that the oxygen is stored at high pressure – so the containers are probably quite small. My next question is how you manage to maintain a suit pressure of 300 mmHg if you are delivering from high pressure tanks? You mentioned that you are a flight-suit enthusiast – which other space suits have you tried on and where were they designed? How do they compare in terms of oxygen storage and carrying capacity? Hi Sari, great questions! The suit pressure is maintained by regulators (prime and backup) and the pressure is reduced in stages between the O2 cylinder and the regulator, so that you do not get 450 bar delivered directly into the suit…which would be interesting! This system is very similar to the method used for SCUBA diving. If the suit pressure gets too high, there is a pressure relief valve which would open and vent excess pressure to atmosphere. As for other suits, I have also worked in the US spacesuit which is very similar in design as far as O2 storage and delivery is concerned. Well thank you for taking time to answer my questions – it’s so awesome that you guys find time between all the training!